Pedro’s extra-time winner gave Chelsea victory at Leicester City to set up an FA Cup semi-final date with Southampton at Wembley. Antonio Conte’s side dug deep after the midweek Champions League defeat in Barcelona to keep their hopes of silverware alive as they survived an attacking assault from The Foxes. Alvaro Morata took Willian’s pass in his stride to beat Leicester keeper Kasper Schmeichel in composed fashion to give Chelsea the advantage just before half-time. But Jamie Vardy made amends for a poor headed miss when he pounced in a goalmouth scramble for a 76th minute equaliser. The decisive moment came just just before the interval in extra time when Chelsea substitute Pedro beat the onrushing Schmeichel to N’Golo Kante’s cross and headed in the winner. Chelsea will play the Saints – who reached the last four by beating Wigan earlier on Sunday – on either 21 and 22 April at Wembley. Manchester United and Tottenham Hotspur, who won their respective quarter-finals on Saturday, will contest the other tie. Chelsea manager Antonio Conte’s hopes of silverware this season – which increasingly looks like it will be his last at Stamford Bridge – rested entirely on this game after the Champions League exit to Barcelona. And how superbly Conte and his players responded to that disappointment, as tired bodies and minds managed to keep their FA Cup aspirations on track in the face of Leicester’s relentless effort. Chelsea looked to have lost momentum when Vardy scrambled home The Foxes’ equaliser 14 minutes from the end of normal time to ensure this compelling quarter-final would go the extra distance. But Chelsea showed renewed character, resilience and quality to disappoint a typically fervent home support and demonstrate some of the old steel that brought Premier League title success in Conte’s first season. Conte was, as usual, the driving force from his technical area, and the nature of this performance (and indeed the display in defeat in the Nou Camp) was proof that, despite all the uncertainty surrounding his future, these players are still performing for their manager. He also retains the faith of Chelsea’s fans, who chanted Conte’s name loudly in their corner of the King Power Stadium. The manager repaid their loyalty with an outstanding victory. Morata has suffered mixed fortunes in his first season at Chelsea following his £60m move from Real Madrid – but he can look back on this FA Cup quarter-final with a fair degree of pleasure. The Spanish striker, who was left out of his national squad this week, not only applied a cool finish to Willian’s pass to put Chelsea in front in the first half, but it came after the sort of physical roughing-up some have suggested Morata has struggled to deal with in his first season in England. Morata was on the receiving end of some heavy treatment from Leicester’s Harry Maguire, who was booked, and captain Wes Morgan. But the Spaniard had the final word with his moment of quality. 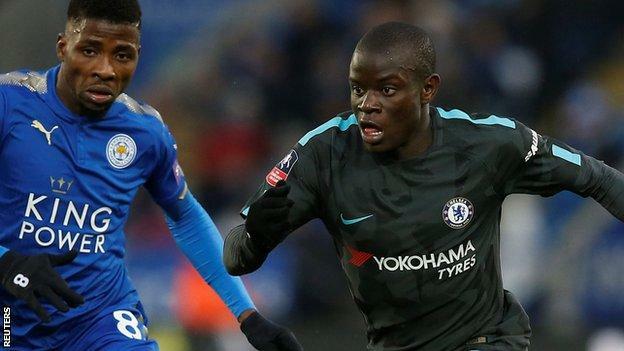 And former Leicester City title-winner N’Golo Kante gave a majestic midfield performance from first to last, breaking up play and creating in equal measure to prove again he is in the highest bracket of midfield operators. Leicester had every right to feel confident ahead of a home quarter-final against opponents who were still hurting from that damaging Champions League defeat. And Claude Puel’s side got so much right, even looking to have the wind in their sails once they drew level through Vardy. Leicester, however, conceded two goals that Puel will regard as soft. Kelechi Iheanacho played a poor pass to Riyad Mahrez, allowing Willian to break and set up Morata, while Chelsea’s second goal was also avoidable. Once Schmeichel came for Kante’s cross in extra time, it had to be his. Instead, he misjudged it and allowed the diminutive Pedro to beat him to become the unlikely winner of the aerial duel. “I’m a bit upset at the moment because I think we deserved another result. “They found a good, clinical edge. Morata’s goal was the only chance of the first half, it was harsh to concede just before half-time. But we came back with more calm and more quality. “I’m proud of my players because it was a game with a high level against a good team. We improved and we deserve another result. “I think since the beginning Kasper has been a fantastic goalkeeper. In goal there is always a mistake but he has been fantastic. “It was a tough game but we knew this. The last game at home [a 0-0 draw in January] we suffered a lot against Leicester. “We must be pleased. I saw a good performance and great character from my team. Chelsea have reached the FA Cup semi-finals for the fourth time in the past seven seasons. Of the previous three occasions where Chelsea have faced Leicester in the FA Cup, the Blues have knocked The Foxes out en route to winning the competition (1997, 2000 and 2012). Leicester have lost their last four FA Cup quarter-finals – the last two against Chelsea – and have not reached the semi-finals since 1982. Excluding his defeat in last season’s final against Arsenal, Antonio Conte has now progressed from all nine of his FA Cup ties in charge of Chelsea. Jamie Vardy has scored 10 goals in 12 appearances in all competitions against ‘big six’ opposition this season. Alvaro Morata’s goal was his first in 14 appearances in all competitions for Chelsea, ending his longest run without a goal since joining the club. Willian has been directly involved in 10 goals in his last 10 FA Cup appearances for Chelsea (six goals and four assists). The Brazilian has had a hand in 18 goals in his last 20 starts for Chelsea in all competitions (12 goals and six assists). Pedro has been directly involved in eight goals in his last 10 FA Cup appearances (six goals and two assists). Match ends, Leicester City 1, Chelsea 2. Second Half Extra Time ends, Leicester City 1, Chelsea 2. Offside, Leicester City. Wilfred Ndidi tries a through ball, but Shinji Okazaki is caught offside. Attempt blocked. Adrien Silva (Leicester City) right footed shot from the right side of the box is blocked. Assisted by Riyad Mahrez. Corner, Chelsea. Conceded by Wilfred Ndidi. Corner, Leicester City. Conceded by Victor Moses. Attempt blocked. N’Golo Kanté (Chelsea) right footed shot from the centre of the box is blocked. Attempt blocked. Fousseni Diabaté (Leicester City) left footed shot from the left side of the six yard box is blocked. Attempt blocked. Riyad Mahrez (Leicester City) left footed shot from the centre of the box is blocked. Assisted by Jamie Vardy. Fousseni Diabaté (Leicester City) wins a free kick in the attacking half. Second Half Extra Time begins Leicester City 1, Chelsea 2. Substitution, Leicester City. Adrien Silva replaces Vicente Iborra. Substitution, Leicester City. Fousseni Diabaté replaces Danny Simpson. First Half Extra Time ends, Leicester City 1, Chelsea 2. Goal! Leicester City 1, Chelsea 2. Pedro (Chelsea) header from the centre of the box to the bottom left corner. Assisted by N’Golo Kanté. Attempt missed. Pedro (Chelsea) right footed shot from the centre of the box is too high. Assisted by Eden Hazard. Offside, Leicester City. Vicente Iborra tries a through ball, but Jamie Vardy is caught offside. First Half Extra Time begins Leicester City 1, Chelsea 1. Second Half ends, Leicester City 1, Chelsea 1.